South Korea and the United States will launch the new Dong Maeng combined exercise this week to replace their springtime Key Resolve drills, their militaries announced Sunday. Seoul's Joint chiefs of Staff and the South Korea-US Combined Forces Command said that the nine-day command post exercise kicks off on Monday, two days after the allies' defense chiefs decided to end the annual Key Resolve and Foal Eagle maneuvers to back diplomacy for the denuclearization of the Korean Peninsula. "Dong Maeng, which means alliance in English, has been modified from the previously held spring exercises Key Resolve and Foal Eagle and will focus on strategic, operational and tactical aspects of general military operations on the Korean Peninsula," they said in a joint press release. Seoul's JCS Chairman Gen. Park Han-ki and CFC Commander Gen. Robert Abrams jointly said that the upcoming exercise is important for professional armies to train and maintain "a standard of readiness." "These exercises are crucial in sustaining and strengthening the alliance," they were quoted as saying. With the Key Resolve effectively supplanted by the new exercise, the allies are expected to conduct low-key battalion-or lower-level drills in place of the Foal Eagle field training throughout the year. In telephone talks Saturday, Seoul's Defense Minister, Jeong Kyeong-doo, and acting US Defense Secretary Patrick Shanahan decided to end the two exercises, reflecting their resolve to keep alive dialogue with Pyongyang despite the breakup of last week's summit between President Donald Trump and North Korean leader Kim Jong-un. Pyongyang has criticized the exercises as rehearsals for invasion despite the allies' argument that those regular drills are purely defensive in nature. "The minister and secretary made clear that the alliance decision to adapt our training program reflected our desire to reduce tension and support our diplomatic efforts to achieve complete denuclearization of the Korean Peninsula in a final, fully verified manner," Seoul's defense ministry and Pentagon said in a joint press statement. The decision was based on recommendations by Gen. Park and Gen. Abrams, they said. Jeong and Shanahan also affirmed their continued support for their armed forces, the CFC and the US-led UN Command for peace and security in the region. The Key Resolve exercise refers to computer-simulated war games based on the allies' contingency plans against North Korean aggression. 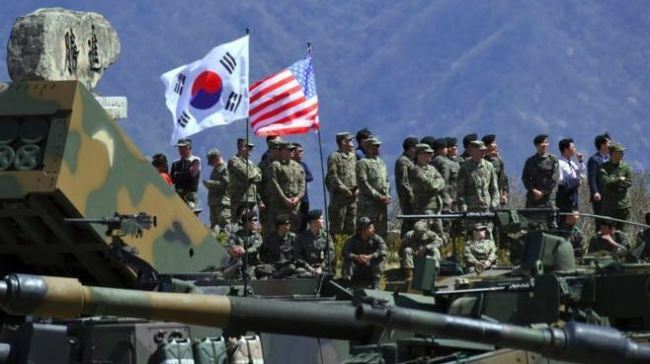 It involves staff and troops from South Korea's defense ministry and military, and those from the US Forces Korea and the US Indo-Pacific Command. The exercise originated from the RSOI (reception, staging, onward Movement, integration) exercise, which was renamed the Key Resolve in 2008 due to the need to reorganize the exercise in line with a 2007 deal between the allies on the transfer of wartime operational control. The RSOI was first staged in 1994 after the allies' Team Spirit exercise, launched in 1976, was suspended amid diplomacy with Pyongyang. The Foal Eagle field training was first launched in 1961. Since 2002, it was timed to coincide with the RSOI to enhance the efficiency of the combined drills. After the renaming of the RSOI in 2008, it proceeded together with the Key Resolve. In recent months, the allies' military authorities have repeatedly said that they are committed to facilitating ongoing diplomacy to denuclearize the North and foster a lasting peace regime on the divided peninsula.